Acquisitions of Echelon and Wind River aim to breathe life into these forerunners of the Internet of Things, reminding me what a long, strange road it's been so far. Adesto’s acquisition of Echelon and Intel’s sale of Wind River to a private equity firm reminds me how little we know about how the IoT will play out. I spoke with chief executives from both companies last week, and it was like a double-barrel blast from the past. In 1990, Echelon was a startup, coaching us in the emerging market for home networks. We wrote stories about whether these nets would come in the form of Echelon’s proprietary powerline technology, interesting new wireless options like HomeRF promoted by Intel, or some dumbed-down version of the Ethernet just starting to take off in the office. We imagined home media servers and all sorts of consumer tech exotica. Then Intel made a big bet to integrate Wi-Fi in notebooks. It spent a couple hundred million bucks driving the idea of hot spots, and after a few years, it was game over — sort of. Wi-Fi became king of the home network, but the many smart connected devices that we imagined are still fairly exotic items for the adventurous. Along the way, Echelon shifted to industrial networks and got some traction. Slowly, it grew an installed base said to be as large as 140 million nodes today. But standards came to powerline networks. Smartphones expanded Wi-Fi and established Bluetooth networks and put a virtual controller for them in everyone’s pockets. A handful of other options from 6LoWPAN to Thread and Zigbee got a foot in the door. Enter Narbeh Derhacobian, chief executive of Adesto Technologies, a memory chip vendor that uses IOTS as its handle on the stock market. As a public company, Adesto needs to grow beyond its emerging-memory technology. So earlier this year, Adesto bought an Irish ASIC design company. Then this month, it bid $45 million for Echelon and its installed base of LONworks nodes and gateways, now bumping along the bottom of the IoT market hype at single-digit growth rates. Echelon is sitting on $15 million in cash, a sweetener for the deal. It’s Business 101. Expand from memory to logic and systems and software, cross-selling to the three companies’ customers. Expect the next generation of LONworks to support more modern rivals such as Thread. 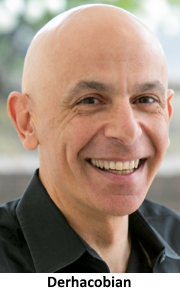 “My first impression of Echelon was this was the original IoT company … they were way ahead of their time in vision … we’re just in the beginning of IoT now; industrial markets move slowly,” Derhacobian told me. In five years, he hopes that two-thirds of the expanded Adesto’s business will be in industrial IoT. It’s an ambitious but rational goal. However, Echelon’s history reminds us that the future is not obliged to act rationally. Like Echelon, Wind River has been buffeted by the tech fates. Once the king of the hill in embedded operating systems, it lost ground to Microsoft’s embedded push. Then they both fell before the juggernaut of free, open-source software. 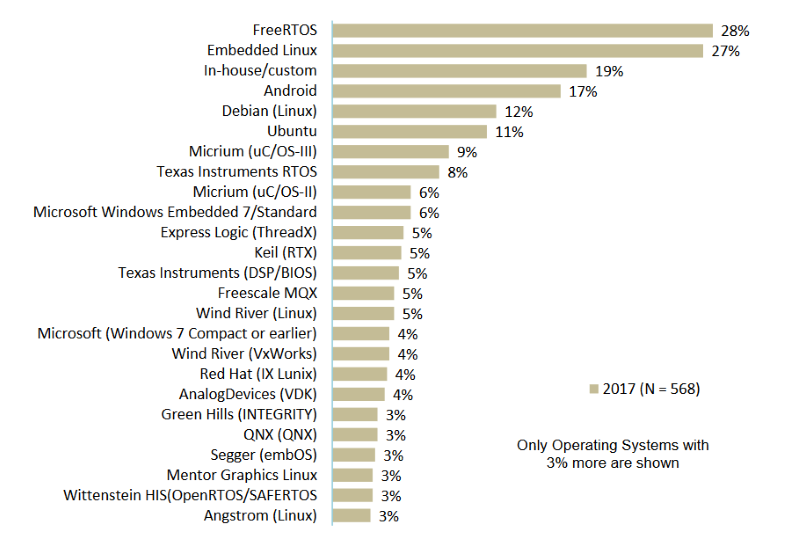 Today, five of the top six embedded operating systems are open-source products with in-house code being the sixth, according to our 2017 embedded markets survey. Wind River’s embedded Linux and its industrial-strength VxWorks come in around 15th. Wind River was smart to be among the first RTOS providers to embrace Linux. A few years later, Intel gobbled up the company as part of its goal to expand its footprint in software and security. Analysts said that it was bad news for Intel to own an OS provider that served the wide range of embedded processors. Eventually, that proved to be true. “As part of Intel, we kind of lost the right to have strategic relations with other silicon companies. We couldn’t get access to roadmaps and plan future value for customers,” said Jim Douglas, named chief executive of Wind River after it was acquired by TPG Capital. For its part, Intel’s IoT group wants to spend more on market-specific hardware IP. So management sold off or folded a total of four software companies recently — Wind River, McAfee, and two smaller concerns. Wind River grew slowly under Intel’s watch to something north of $300 million in revenues and is profitable with about 1,200 people. As a private company, it has a new mission and message that, like Echelon, is aimed mainly at industrial IoT. Industrial companies need to adopt virtualization to consolidate multiple workloads on fewer, more powerful processors. Then they will have the muscle to run machine-learning workloads. Our survey shows that most embedded systems still use 32-bit processors, though even smartphones moved up to 64-bitters a few years back. To enable the transition, Wind River aims to sell a mix of embedded Linux, RTOSes, hypervisors, and other tools — some of them bundled into edge-computing packages coming later this year. Imagine an industrial version of the company’s Titanium, a package enabling network-functions virtualization for carriers. It may, indeed, be a decade-long transition. Our 2017 survey showed that adoption of virtualization software has stalled out with use in 15% to 20% of embedded systems companies over the last four years. That said, many respondents said that 2019 will be the year that they start dabbling with machine learning in some form, and half are already using computer vision. I think that Wind River and Adesto both have well-thought-out visions for where IoT ought to go. Where it actually heads is still anybody’s guess.